S/V MOMO: An Expression of Doubt — How can Hydrovane Self-Steering really be any good? An Expression of Doubt — How can Hydrovane Self-Steering really be any good? The Hydrovane in all its naked glory. In the interest of full disclosure, let me be perfectly clear. I have built my own self-steering gear in the past, I've modified the one we're using now (because I like to tweak), and I have helped others get their self-steering gear under control. But I have no personal experience with a Hydrodvane. You don't see them very often compared to other kinds of systems. The only one I've ever fondled was on a Waterline 50, and the owner expressed displeasure because it didn't do the trick. The Waterline 50 is admittedly a large boat — it is heavier than Hydrovane recommends. But the makers of Hydrovane shamelessly encourage the use of their product for boats that exceed their own recommendations, noting that they "know of and even provide many installations for boats in excess of those limits." They might indeed be willing to "tell you about the many 50,000 lb. or 23,000 kg boats that also have glowing reports of their Hydrovanes," but the fellow I know clearly isn't one of them. My skepticism arises mostly from a theoretical assessment of the gear and from an utter inability to understand how it could possibly work very well. If you want to hear about how wonderful the Hydrovane is, I refer you to their website. But much of what I've read there sounds like half-truths. Thus, for example, when you follow the link that takes you to the testimonials of "famous sailors," you'll be greeted by a photo of Jimmy Cornell's "Aventura" sporting a Hydrovane. But what they won't tell you is that Cornell currently touts the servo-pendulum by Windpilot. "I switched from Hydrovane to Windpilot," he writes, "because I felt that the Hydrovane system may not be powerful enough for a 43 ft. boat." Or perhaps Windpilot just pays him more -- who knows. In any event, my purpose here is simply to raise a few doubts and encourage prospective buyers to perhaps think twice before spending "25-40% more than good of servo-pendulums" (for some reason, Hydrovane subscribes to the "if-you-charge-more-they-will-buy-it" philosophy) on a mechanical self-steering device that might very well prove to be a major disappointment. Something I do know for certain is that robust and effective self-steering gear is the key to happiness. I know this from our own experience and from the experience of watching the tribulations of others. On our passage to Hawaii, our Sailomat servo-pendulum gear kept us on course as we bounced around in the nastiest cross swell we’ve ever experienced in forty knots of wind for days on end; meanwhile, we were in radio contact with a skipper not very far away, whose autopilot (which was supposedly more than adequate) gave up so frequently that he couldn’t get away from the wheel long enough to pee. Another skipper we know on a Valiant 50 from our stay Mexico experienced a thirty-knot blow as a "survival storm" because his autopilot couldn’t do the job. For a short-handed crew, decent self-steering gear – whether it’s a mechanical windvane or an autopilot – makes the difference between heaven and hell. With respect to mechanical windvanes, there are a number of ways to skin this cat. Most crews rely on servo-pendulum gear. Ours is made by Sailomat, but Monitor is the most common, and there are other manufacturers as well – Aries, Windpilot, Cape Horn, Fleming, Voyager. While we might debate their finer differences, in principle they work the same. A windvane is positioned so that when the boat is on course, the vane is vertical. When the boat veers off course, the shift in the apparent angle of the wind causes the windvane to deflect. The deflecting windvane turns a balanced oar that is in the water. As the oar presents a face to the water rushing past the boat, it is forced to swing like a pendulum. The energy from this swing is transmitted by lines and blocks to the boat’s steering system – either to the wheel or to the tiller – and the boat is brought back on course. Servo-pendulums are not practical for all boats, particularly those that rely on hydraulic steering instead of cables or those with a center cockpit. But there are also other kinds of windvane devices that by-pass most the boat’s steering system and effect the rudder more directly. They use a windvane to deflect a trim tab on the boat’s rudder, which in turn causes the rudder to swing. In all these cases, the power of the wind (which is quite weak) mechanically adjusts the gear so that it harnesses the power of the water (which is immense) to steer the boat. in 18 to 20 knots, heading to Sydney ..."
The Hydrovane, on the other hand, relies solely on the power of the wind to steer the boat. And unless that little magical box which links the windvane to the rudder somehow manages to transcend the laws of thermodynamics, that power isn't very much. This is why the key to the Hydrovane's successful operation is balance. As the manufacturer points out, “the trim of the sails and balance of the boat determine how well the Hydrovane can do its job.” And under the "causes of poor performance," the makers list an “unbalanced boat” (they suggest retuning the rig, changing the rake or position of the mast, cutting the boom — that's some pretty drastic surgery); “unbalanced sails”; “baggy sails”; and a “main rudder locked on the centerline” instead of in the “balanced position” (this a draws attention to the fact that fiddling with the Hydrovane to set one’s course also requires fiddling with the main rudder). Now, I have no doubt that the Hydrovane will steer a nicely balanced boat, but that isn’t saying much, because a nicely balanced boat virtually steers itself. Anyone who has struggled with a wheel or tiller to counter weather-helm knows that a balanced boat is easier to steer than an unbalanced one – this applies equally to biological, electronic, or mechanical pilots. Our youngest daughter can steer the boat in perfect conditions; when the sea picks up and conditions get gusty, we let someone else take the wheel. The measure of an effective pilot is not its performance under “balanced” conditions, but “unbalanced” conditions. And on a boat that is being smacked around by waves, conditions can change from “balanced” to “unbalanced” in a heartbeat – the key is having a pilot with the strength to get the boat back on course and “balanced” again. Let me reiterate this point with another quote from the makers of Hydrovane. They say that a "perfectly balanced" boat "leaves a lot less work for the Hydrovane to do — or put another way: makes the Hydrovane's rudder much more effective." But the logic of this statement is faulty; it really works the other way around: because the Hydrovane is not very effective, it cannot do a lot of work, so the boat must be perfectly balanced. Another way the manufacturers turn vice into virtue is when they stress that you can use the Hydrovane and an autopilot at the same time, something that they point out you can't do with a servo-pendulum gear. In major storms many have used this technique [that is, using an autopilot in tandem with the Hydrovane] when the Hydrovane appears to be challenged to the maximum and needs all the help it can get. That is often the case in the early hours of a storm when the seas are square and chaotic. Once the storm has blown for a while and the seas become more regular then the autopilot can be turned off. clear skies off of California. Sure, it is true that you cannot use your autopilot and a servo-pendulum gear at the same time. But the more important point is that you don't have to. And what the makers of Hydrovane construe here as a virtue (namely that the Hydrovane and autopilot can work together) is in fact a pretty way to dress up a liability: in fact, the Hydrovane needs an effective autopilot in adverse conditions. Again, they note that an autopilot is "comforting to use in storms when uncertain -- [it] can [be] turn[ed] off once control is regained." Frankly, a priority for me in bad weather is to not loose control in the first place. If you have ever had the chance to see a servo pendulum operating in bad weather you would better appreciate where that comment about its power comes from. Its activity can be described as perhaps violent as it wrenches the wheel/tiller from one course to the next. One certainly wants to stay clear of that section of the cockpit. the servo-pendulum is driving the boat. Damn right! We tell our kids all the time to keep their fingers away from the lines, blocks, and wheel. We also teach them to be wary of the loaded sheets and winches. There are a lot of forces at play on a sailboat, especially in nasty weather. But when I look out at our servo-pendulum gear as it navigates our vessel safely through a gale, I don't see violence but grace, and I feel for it a fondness that approaches true love. The best book I have ever read on self-steering gear for sailboats is Bill Belcher's Wind-Vane Self-Steering . Belcher examines an number of different types of mechanical windvanes. His theoretical discussions are incredibly clear. He provides an honest appraisal (untainted by any affiliation with a specific product) of the capabilities and limitations of such gear. And the whole point of the book to help readers construct devices of their own — the book includes detailed plans for a number of different types of gear. Given the outrageous price of self-steering gear, it is reassuring that anyone with moderate skills can make a decent and effective self-steering device for, say, five-hundred dollars. I believe the book is out-of-print, so it may be hard to find. But it's worth looking for. Damn Bernie, that was a pretty scathing criticism of the Hydrovane. I'd never looked into them and am utterly amazed by their lack of "water power" to steer the boat. That's the beauty of a servo-pendulum unit, the worse the weather the better it steers. My Monitor just successfully steered another beautiful 1100 mile passage up to Fiji without a hitch. Still the best piece of gear on the boat and with my installation through the transom having only 2 blocks per side steers dead downwind with steady apparent wind of any strength. BTW I loved the comparison of Jana to the Hydrovane. From the sounds of it I might still take Jana if the wind pipes up! He is certainly right that I have “very little direct experience” – indeed, I make it clear that I have none whatsoever. My critique is based on a reading of material published by Hydrovane itself. The issues I raised are ones that arise from their own presentation of their product. And my sense of distrust derives not only from lack clarity in their presentation, but from the fact that in making their claim that their concept is “superior to any other method of self steering” they wholly misrepresent servo-pendulum gear, which is their product’s primary rival. As for my friend’s experience with the Hydrovane, I would encourage him to describe that experience in detail. But I find it worth mentioning that his is a traditional (that is to say: small when compared to beamier designs) 35’ ketch – a boat that at first glance would seem to be much easier to balance than many other boats. Indeed, a primary virtue of the ketch rig is balance, and Joshua Slocum sailed his ketch “Spray” around the world without any benefit of self-steering gear at all. While the Hydrovane might work well on my friend’s boat, it might not work well on yours. In the end, I’m not telling people not to buy a Hydrovane. I’m simply encouraging them to “think twice.” Self-steering gear is expensive and it is important. It is the kind of thing most sailors only buy once (which is one of the reasons they are difficult to compare and evoke strong loyalties). And at around $5000 USD, the Hydrovane is perhaps one of the most expensive systems of all. I’m merely raising questions that I would want answered before I spent that kind of money; readers can decide for themselves whether they think those questions are worth asking. BA humbug! Each vane has its application. Hydrovanes work well in light air on directionaly stabile long keels (5-10knts) downwind! I like mine bcause it works w/ davits & is strong. For servo gears Sailomat wouldn't be my 1st choice. Weak build/over complicated. Just in case anyone else is reading this while trying to decide on a self steering system, as I did, I'd like to point out that the author has absolutely no experience of using a hydrovane whatsoever. The result is a completrely uninformed review based on nothing but hearsay, and badly applied logic. I'm guessing the 'review' was triggered by the over zealous advertising on the Hydrovane website, which I agree is a bit much, but that doesn't warrant such a completely ill informed review based on.... well, a feeling. From the people I have spoken to with hydrovanes, the exact opposite of what is stated here is true. They work better on more modern responsive boats than on traditional long keelers. I admit I have only done a few 1000 miles with my hydrovane, but it has been the best crew on board for all of them. On my 35' (12' beam) boat, with a fin and spade rudder it is so powerful I have have in the lowest setting to stop it over compenstaing. I've used server pendulum vanes as well in the past, which are also great, but the hydrovane I have now would never be replaced, it is fantastic. What a nasty review form a person that admits no experience of the Hydrovane! Still, for somebody that states Hydrovanes "little magical box which links the windvane to the rudder somehow manages to transcend the laws of thermodynamics" clearly does not even understand Thermodynamics is the science of heat in relation to other forms of energy and work. So we can safely assume the nasty review, is no more then hot air. Still it provided my staff with a good laugh so all was not lost. One of my staff just completed 9000 miles, on his 20 tonner, with Hydrovane, with out a hitch. Even that good gent found the review funny, so keep it up, we cant wait for the next technical installment. Interesting stuff...I owned a number of yachts in the past 30 or so years. Some were traditional long keelers (2) and the latest was a Lidgard 45...all except one were fitted with an ARIES..I had no complains. I built one auxiliary type self steering gear and couldn't make it work..like the HYDRO the rudder is a lot smaller then the ships rudder, with the main rudder locked in position the smaller aux. rudder has to do all the work..and when the main rudder is locked in position it would act as a extension (increasing the area)of the skeg, therefore shifting the lateral balance and actually inducing weather-helm.. I just bought a 40' S&S which has a HYDRO fitted...I haven't had the opportunity as of now to test the gear in more extreme conditions, so far I'll rate it 7 out of 10..if the gear doesn't perform I'll switch back to a penulum servo van..Monitor.. Thanks very much for taking the time to evaluate Hydrovane. I've been reading and re-reading the content of their website for a few days now and in truth have become increasing frustrated trying to separate the wheat from the chaff. Your comments have convinced me it is time to move on. Thanks again and safe sailing. I sailed 30.000 miles of oceans with my Hydrovane fitted on my 36' Westerly Conway, and can confirm that Bernie's analysis is correct. All the owners of Hydrovane we met said that their steering system was fantastic, but then admitted to use mostly the electric autopilot on passage and keep the windvane as spare rudder. If the boat is not perfectly balanced, and this makes that you need to give up a lot in speed, the Hydrovane is not powerful enough, especially in crossed seas, when the occasional wave pushes the stern out of track and the Hydrovane does not have the power to bring the boat back on track. 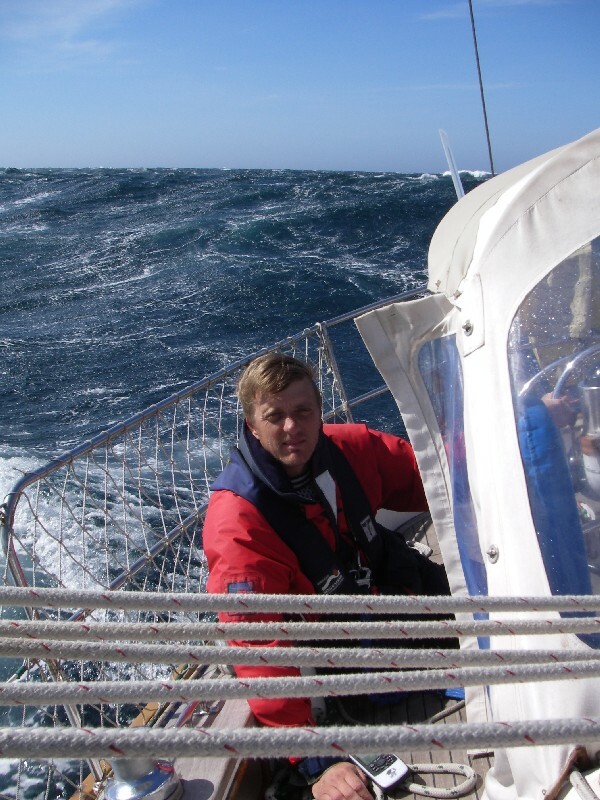 In gale force conditions, we always had to reduce massively our speed downwind or the Hydrovane could not cope. The Hydrovane is less and less effective the more the weather conditions deteriorate. Exactly the opposite than a servo pendulum system. We also lost our Hydrovane rudder, while hoving to in a storm in south pacific. We had made the mistake to rely on a bolted screw, as we had lost the original pin. The rope of 10 mm tied to the rudder was not enough to save the rudder. The impossibility to lift the rudder for hoving to, puts a lot of strain on the Hydrovane. Said that we payed 700 USD for it, second hand in the Caribbean. And we are happy to have it. But if we had to buy a new windvane ex factory, the Hydrovane would be the last on our list. Our choice would definitely go on a servo pendulum system that you can lift. Thanks for your input, Pappy. Very seldom do I check the comments on our blog (we are neglectful blog writers), so I was surprised to find that yours is just two days old. I have no problem if you pass on the link. We have loved our Hydrovane. We have used it on virtually every offshore passage mile (downwind, upwind, strong wind, light wind) since 2009. The only time we don't use it is when we motor (rarely). I love that we have a built in emergency rudder. The only thing I don't like is the difficulty of removing the rudder if we are coming in from offshore into tight quarters maneuvering (which the extra rudder makes more difficult) but this has been extremely rare. 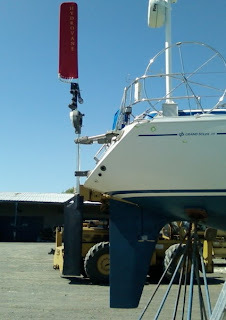 We installed ours offset to keep our swim ladder and on our size of boat and type of stern we didn't need huge ugly brackets - just a nice slim streamlined look, or as close to that as a vane can get. We don't get any kick backs or anything. We paid full price and it definitely goes on our "Good Show Award" list of Pacific crossing gear. There are other options for boats with hydraulic steering -- servo-pendulums with auxiliary rudders, auxiliary rudders with trim tabs, trim tabs mounted on the boat's own rudder. The last one -- trim tabs mounted on the boat's own rudder -- intrigues me the most. I'm pretty sure it would need to be a do-it-yourself project, but it shouldn't be too expensive. Servo-pendulums with auxiliary rudders, on the other hand, are commercially available. We have a hydrovane on our heavy 43 ft ketch. Yes , sail balance is important. Overall the device works very well. We have hydraulic steering, with 4 to 7 full turns stop to stop. Any device that requires hooking up to the helm, will not work. Hydrovane is fully independent of the helm. We have been active cruisers for the last 10 years. The Hydrovane has been a tireless addition to our crew. We have a Hydrovane (buit 2014) And I can only say that your appraisal of the system is correct. The system will work well on any boat up to 36-40 foot but nowhere as good as a servo system. Our boat is 47ft long, aluminium and weighs 10.500 kgs. For us, the Hydrovane is an expensive piece of useless junk. Nothing on our boat has caused so much dismay and anger as this unit. In gusty conditions it is not only useless but down right dangerous. Two weeks ago coming from Madeira to Lanzarote the HV steered the boat, (which we balanced so well, that the hydraulic steering hardly even moved when we switched it on! ) the HV steered from a true wind angle from 72 degrees right up to 150 degrees this means we were zigzagging 35 degrees either side of the course! in a following wind this would mean constantly gybing! after an hour we disconnected it (again). I have spoken to quite a few HV owners and now know, that mostly all owners of boats up to a maximum of 40 ft are happy and call the HV fantastic. All owners over 40ft tend to call it unsatisfactory (mainly much stronger language is used) I have been in touch with Hydrovane and have told them that we just cannot get the damn thing to work properly, we have had no satisfactory advise other than sanding some material off the leading edge of the rudder???????????? When we bought the boat last year (a cigale 14) the owner admitted that he had never used the HV much as he could not get it to work properly. We have tried everything, even running it with the elec.Hydraulic gear switched on, in which case the HV seems to cause even more problems. I can strongly advise anyone thinking of purchasing a hydrovane to TRY IT ON THE BOAT first. Do NOT blindly Believe what Hydrovane.com say. PS if anyone wants to purchase our unit, its for sale!! and good riddance! Of you still have your HV and want to sell it, please contact me. Anonymous of 25/8/17 is your hydrovane still for sale? My boat is only 31ft! I have sailed with my hydrovane since 2007, 70000Nm plus. The main issue with Hydrovanes is they need constant adjustment in variable gusts or around coastal waters where you have headlands. They can easily put you on a beach. I sail Nicholson 35 and often lock the hydrovane and let the boat sail herself when the winds are too light to power the wind vane/rudder arrangement, or when under spinnaker. In storm conditions it is helpful but not powerful enough to follow a course for a long time, especially in chaotic seas. There are tricks you can use to prevent the wind vane from over steering under normal rough sea conditions such as giving it a bridle. Hydrovane recommend reducing sail when the hydrovane struggles, with a hull speed of 7Knots and a ocean to cross I dont slow down for anyone. I do think that it would be possible to modify the hydrovane and fit a servo mechanism. A thing you need to consider with all of these steering systems attached to your transom, is they put a load onto your transom the boat was not designed to take. A good electric autopilot operating directly on your helm is the modern way to go and more reliable as long as you have battery power. They do however ware out and need servicing. How much will you pay for a used hydrovane in good working order? Joshua Slocum's Spray was a yawl, not a ketch. What else are you wrong about?